Commissioned by Alexander, marquis of Douglas [1767-1852, from 1819, 10th duke of Hamilton], Hamilton Palace, Strathclyde, Scotland; by inheritance to his son, William Alexander Anthony Archibald Douglas, 11th duke of Hamilton [1811-1863], Hamilton Palace, Strathclyde, Scotland; by inheritance to his son, William Alexander Louis Stephen Douglas-Hamilton, 12th duke of Hamilton [1845-1895], Hamilton Palace, Strathclyde, Scotland; (Hamilton Palace Collection sale, Christie, Manson & Woods, London, 17 June - 20 July 1882 (8 July), no. 1108); bought by (F. Davis), probably buying for Archibald Philip Primrose, 5th earl of Rosebery, [1847-1929], London; his son, Albert Edward Harry Mayer Archibald Primrose, 6th earl of Rosebery [1882-1974], London; sold 15 June 1951 to (Wildenstein & Co., London and New York); sold February 1954 to the Samuel H. Kress Foundation, New York; gift 1961 to NGA. 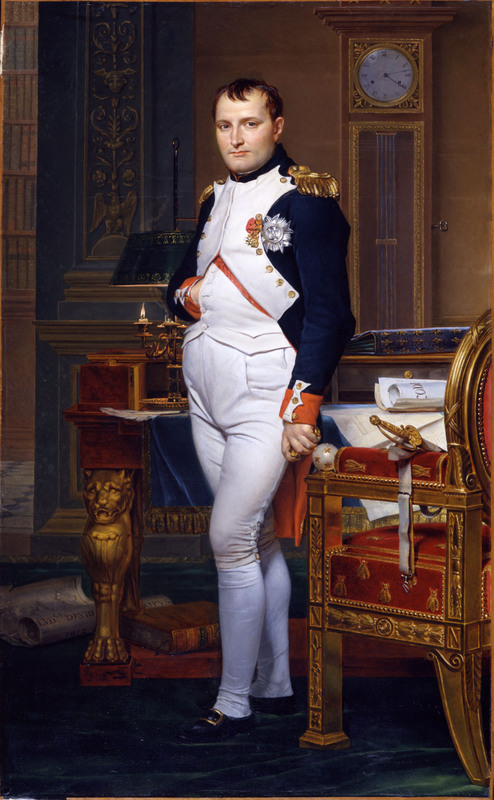 Two of the three lists that David made of his works mention the NGA painting: "List B," compiled about 1815, describes it as "Le portrait en pied de l'Empereur représenté dans son Cabinet. Tableau pour l'Angleterre" (Schnapper, Antoine, et al., Jacques-Louis David 1748-1825, exh. cat., Louvre and Versailles, Paris, 1989: 20); "List C," dated 1819, refers to the original painting under no. "49. Napoléon en pied dans son cabinet.--Pour le marquis Douglas en Angleterre" and to David's copy of it under no. "50. Une répétition du même avec des changements dans l'habillement.--Pour M. Huibans" (Wildenstein, Daniel, and Guy Wildenstein, Documents complémentaires au catalogue de l'oeuvre de Louis David, Paris, 1973: no. 1938; Schnapper et al. 1989: 21).